Sutton Foster at the Broadway Playhouse. The radiant, gangly, Tony-winning Broadway star Sutton Foster has opened Chicago’s new Broadway Playhouse with style and heart. Some would argue that Ms. Foster is the last true Broadway star. No other actor of her generation has originated so many lead roles in new musicals on Broadway who isn’t a) a movie star, b) a TV star, c) an American Idol, d) a powerful producer’s daughter. She’s just Sutton Foster, of the bright, big voice and easy-going personality who broke out from the chorus nine years ago because someone gave her the chance to take over the lead in the hit musical Thoroughly Modern Milly. Two of those star makers were producers Mike Isaacson and Kristin Caskey, who were on hand last night to introduce Ms. Foster to the buzzing audience as she officially “blessed” the Broadway Playhouse. About that new space. It seems like only yesterday that it opened its doors as Drury Lane Water Tower — the less popular step sister of Drury Lane Oakbrook Terrace. Now, purchased by Broadway in Chicago, the space has gotten a sleek, urban makeover. Gone are the red carpets, cream walls and gold chandeliers. In their place are black, chrome, neon and a splashes of red, with a striking new lobby entrance. The place is contemporary to a fault. While I’m not sure the design pendulum needed to swing so far away from the tacky-glam Drury Lane aesthetic (the neon light tubes are a bit overkill), it’s an impressive space. I can’t wait to see how Broadway in Chicago will utilize it. And now to Ms. Foster. With her unassuming demeanor, unmade face and straight brown hair, you immediately feel at ease when she’s on the stage — like she’s that dorky, talented friend who you always knew would make it big. So it’s perfect she should be the first person to test out the space. She just radiates good vibes. In her 1.5 hour, one act set, she sings the hits from her already impressive stage career along with folksy, simple tunes from her album, “Wish.” I particularly enjoyed her wistful take on Sondheim’s “Anyone Can Whistle.” The woman can weave a spell. With a voice like hers, which is full of bright, Broadway pizzaz, you’re waiting for her to step away from the introspective, plaintive songs and, well, belt! Thankfully, she devotes a small (too small) section of the show to “really high belt songs.” She literally puts the titles of five big belting songs in a cup — “The Story Goes On” from Baby, “Meadowlark” from The Baker’s Wife, “Defying Gravity” from, well you know, “Don’t Rain on My Parade” from Funny Girl, and “And I’m Telling You” from Dreamgirls — and asks an audience member to pull out a title for her to sing. I wanted “And I’m Telling You,” but we got “Meadowlark,” which she started softly and built up to the requisite and promised belt. And wait ’till you see what she does with “Show off,” the number from another Tony-nominated role of hers. I think at that point the audience fell in love. Two standing ovations later and a performance of the number that made her a star (“Gimme Gimme“) sent the audience home delighted and charmed. Following Ms. Foster, who plays through Sunday (more info here), is Traces, a French-Canadian acrobatic team that will leap in Oct. 26 – Dec. 19, followed by a revised version of Working, (Feb. 15-May 8, 2011), the musical based on Studs Terkel’s book that will star Chicago favorites E. Faye Butler, Barbara Robertson and Gene Weygandt (I can’t WAIT for this one). 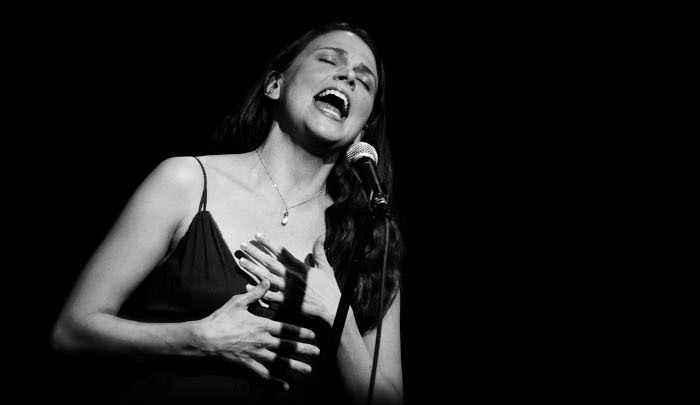 Great review – I am looking forward to seeing Sutton Foster on Sunday! Interestingly enough I took one look at that first picture and thought “She looks like she’s singing “Meadowlark.” (That’s definitely a Genevieve look going on there). Could also be a “And I’m Tellin’ You!” pose, too. No? She’s the loveliest of lovelies – what a charmer. Meanwhile, whats with the makeover of the space? How … contemporary. Though the original decor did look like something out of a Vegas casino. Granted, the photo they gave us (which I used above) made the space look darker than it *really* is. However, it’s still pretty cold, aesthetically. The lobby, however, is very nice. Wish I could have been there! Sounds awesome! Hey, Broadway Critic! Thanks for commenting. Indeed, it was a lovely night. Followed by a lovely reception at the Ritz-Carlton where I was thisclose to Sutton, but too enchanted to speak to her. Hey, Bob, Sutton did put on a fabulous show – but you forgot “Don’t Rain On My Parade” as one of the five songs she could’ve sang. I was hoping for that or “And I’m Telling You” – but her “Meadowlark” was quite lovely. Ah yes! I *knew* I was forgetting one. Thanks! Lovely review! I’m going to be seeing her tomorrow and cannot wait! Do you know how I could meet her afterward? Is it the usual stage door or does she do a lobby reception? Hope you enjoy it, E.L.! Afraid I’m not too familiar with the stage door sitch. Previous Post ‘Rock of Ages’: drink a Bud and bang your head!